Site Details & Ownership: The site, owned by Town Centre Securities, consisted of an open grass area with the topography of a small mound and a towpath edging a small basin. Adjacent site uses are regenerated residential building and sport, leisure and retail. On one edge there was a brick wall bounding a higher level road, and on the other sides there were footpaths and towpaths. 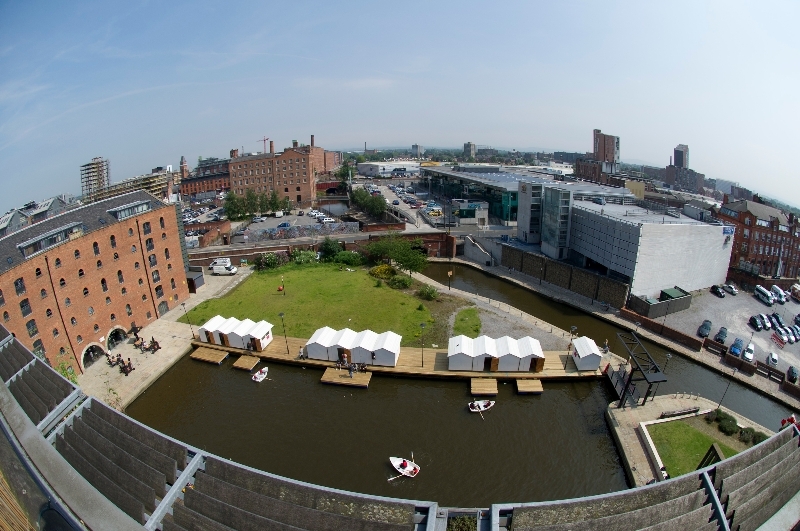 Project Reach / Visitors / Target Audience: The project aimed to raise the profile of the Piccadilly Basin by targeting the wider community of Manchester and beyond. One thing documented on site was that the audience for the project was much wider than anticipated and included explorers, sunbathers, ballgamers, artists and fishermen. The project reached 162,292 people on Facebook and was subject to only 4 incidents of anti social behaviour. 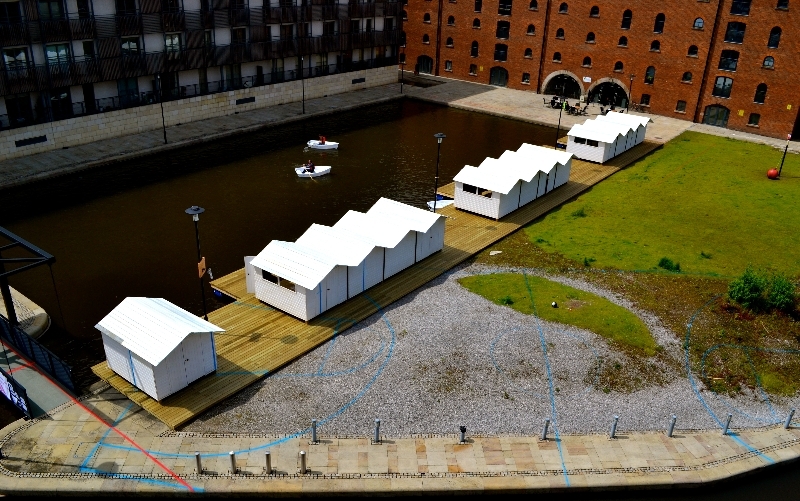 Upon completion the project was dispersed to 6 locations across Manchester. Problems Encountered / Overcome: Internal negotiations were key to the success of the project by encouraging a collaborative working environment with 605 kilometres between Manchester and Paris. Negotiating permission to run a boating lake was far from straightforward. Jacksons Basin is owned by Town Centre Securities but the water itself is owned by Waterways so permission was required from both parties in addition to relevant insurance. Key to the project was the relationship with the site. Manchester was observed as the starting point for the project and the topic most associated with the context of Manchester was the rain. During the twelve day construction on site it rained for eight of them and continued to rain throughout the majority of July. 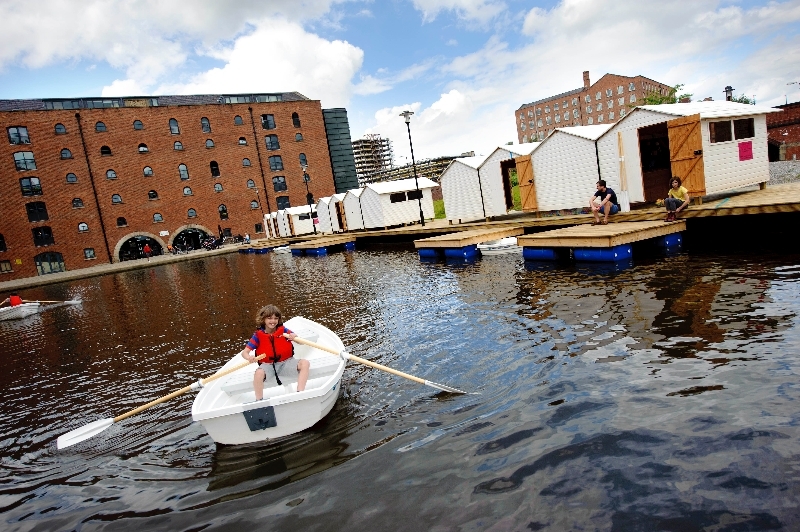 Feedback from users / staff: Both physical and virtual feedback was collected from visitors in the form of boat handover forms and a visitors' book on site as well as Facebook and Twitter. The project was also published in a number of local and national publications and alongside a cluster of projects in the Basin over the summer generated an estimated PR value of £450,000. One of the most poignant comments was written in the guest book by a seven year old girl who said that ‘It is good because it is unexpected’ after asking her dad how to spell unexpected. What next? Atelier [zero] was relocated to six places in four categories, garden, gallery, school and office. Sheds are now being documented at Moss Side Community Allotments, Hulme Community Garden, Manchester Garden Cities, The Lionel Dobie Project and Manchester School of Architecture. A boat sits on the roof of the London HQ of the Office for Subversive Architecture. Project Website / Further Info: See conference paper ‘Atelier [zero] Negotiated Dialogues’ on the subject of the dialogues of project negotiation. Production of Place 2012 at University of East London.